Q: What is a karambit? Q: Where do karambits come from? Q: What are karambits used for? Q: Why are karambits shaped so weirdly? Q: Why do karambits have a ring? Q: Do karambits have to have a ring? Q: What are the advantages offered by a karambit knife? Q: Who should consider carrying a karambit? Q: How do you carry a karambit? Q: Are there different types of karambits? Q: What type of karambit is best? Q: Are karambits legal to own? 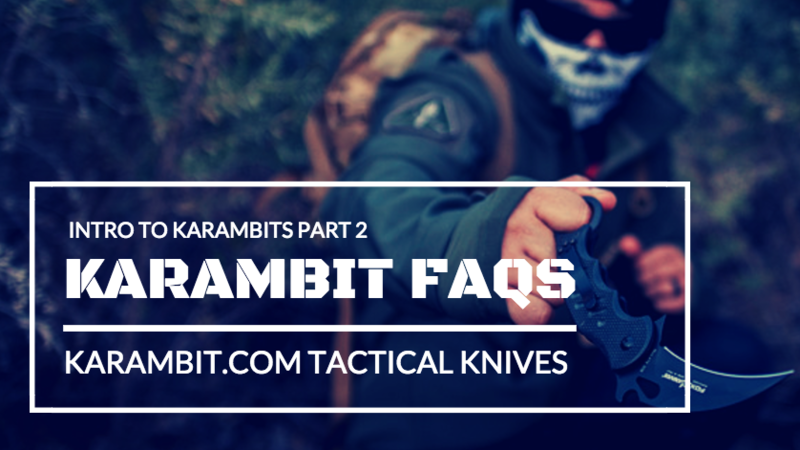 Q: Are karambits legal to carry concealed? Q: What are the laws in the United States about karambits? Q: What are the laws internationally about karambits? Q: Is the karambit a fighting knife? Q: I'm not a martial artist. I'm a hunter, fisherman, rock climber or backpacker. Can a karambit be useful to me as a utility knife? Q: I'm military, a first responder, EMT, paramedic, search and rescue technician, LEO, or other field operative. Can a karambit serve as a field or survival knife? Q: Can I carry a karambit as an every day carry blade? Q: Are there varieties of karambits that are best for beginners? Q: How can I learn to use a karambit? Q: Should I learn to spin a karambit? Q: Is a training karambit necessary? Q: At what point should you switch from a training blade to a live blade? Q: I've heard karambits are dangerous. Are they? The karambit is a small, easily carried utility knife of Southeast Asian origin possessing a curved blade, ergonomic handle and one or two safety rings. It's designed for user safety in any situation, environment or condition, precision in use and maximum functionality no matter the task. According to Indonesian legend and tradition, the karambit's design is based on a tiger's claw. As such, this unique, curved blade readily lends itself to hooking, ripping, tearing and slicing. Dig deeper into karambit basics by reading our karambit overview. Where do karambits come from? The modern karambit has roots in Southeast Asia, particularly Indonesia and the Philippines. Karambit knives first surfaced in ancient Indonesia during the 11th century and quickly spread throughout the rest of Southeast Asia due to a thriving trade industry. Karambits made their way to the United States during the 20th century and were introduced into mainstream culture by practitioners of Filipino and Indonesian martial arts. Nowadays, quality handmade, custom, art/display and production karambits can be found in all corners of the world for any imaginable use or purpose. What are karambits used for? Both the Filipino karambit and Indonesian karambit have been used for centuries as an "every day carry" utility blade that readily doubled as a self defense weapon in times of need. Due to their design, specifically, their curved blade and safety ring, karambits are able to offer many advantages over other types of knives. They're multi-functional and can be used for hunting, fishing, work, farming, combative and many other applications. Any task requiring a knife that offers precision, efficiency and unparalleled user safety can be completed with a karambit. While karambits are internationally recognized as one of the traditional weapons of Indonesia's indigenous combat art, Pencak Silat, and are widely revered for their battlefield prowess, karambits aren't just for fighting and self defense. This time-tested blade offer great benefits to users outside the martial arts community, particularly those who are seeking a dynamic every day carry or utility knife. Why are karambits shaped so weirdly? The karambit's unique appearance is often what draws people to them, but the karambit's design is firmly rooted in function, not form. While the curving blade and other karambit-specific features can be very pretty or alluring, the karambit is shaped the way it is to provide its user with safety in all environments (even underwater, when it's icy or the wielder is hanging upside down), precision and stability when working at odd angles or on difficult tasks and usability in tight, cramped or otherwise usuallyinaccessible spaces. The karambit's curve grants its user extra reach and access to multiple planes of use that a straight blade wielder can only dream of. It also allows the knife to move in several directions at once or to perform two movements simultaneously with only one hand motion from the user. Why do karambits have a ring? The karambit's safety ring offers its owner a secure grip and unparalleled weapon retention. Most importantly, it prevents the knife from sliding back through the user's hand when in use. It also facilitates quick draws and tactile deployments while also ensuring the knife is optimally positioned for use without requiring the user to ever take their eyes off the job at hand. Do karambits have to have a ring? Not technically. Even though the ring is the karambit's most readily identifiable feature for most people, per ancient Southeast Asian design specifications, it's the curved blade shape and the hooking, tearing, and slicing functionality that designates a knife as a karambit. However, it is very difficult to obtain the advantages traditionally offered by a karambit without a safety ring and as such, the modern karambit almost always has a safety or retention ring. What are the advantages offered by a karambit knife? The karambit's assured, no-slip grip offers unparalleled user safety in even the most hostile conditions. Whether it's icy, too dusty to see, or the knife is being used upside-down or underwater, due to the safety ring, a karambit user knows beyond a shadow of a doubt his knife won't move during intricate or detailed work, slide back through his hand causing severe, accidental injury or be dropped, easily disarmed or used against him, even during a struggle or if he falls. Both the user's grip and the actual position of the knife itself can be widely varied to achieve maximum benefit for the task at hand. Unlike other blades, even when switching the hands, the karambit is secure and still able to be used without fear of dropping it or losing control. No other knife in the world offers the karambit's safety and every day carry functionality for routine tasks, including gardening, camping, fishing, hunting, backpacking, farming, construction and other household/work applications, while also providing effective and seamless self defense capability. In combat, the karambit's unique design allows it to easily change fighting ranges without body movement, provides the ability to counter and attack in the same movement, allows multiple strikes to be delivered with one arm movement and it allows lines of attack straight blades are unable to utilize. Its movement in battle is difficult to follow with the naked eye and it's easily concealable. The safety ring offers instant, yet safe, use out of a quick draw and ensures the blade can't be easily disarmed. While there are many other combative advantages offered by the karambit, those are the most pertinent points. Who should consider carrying a karambit? Anyone seeking wide-ranging functionality from their knife, but especially hunters, fisherman, backpackers, rock climbers, spelunkers, field operatives, law enforcement or peace keeping officials, first responders, search and rescue units, military and government workers, preppers and martial artists. Others who will enjoy the karambit's benefits include construction workers, carpenters, plumbers and other utility workers. Not only can the karambit gain access to tight areas others knives can't, but it also provides stability and safety at weird angles, in cramped spaces, in difficult situations and in high-stress situations. As a tool, the karambit is able to be utilized for almost any chore requiring a blade and can also serve as a weapon when needed. Owning a karambit means having to carry only one knife instead of being forced to carry multiple blades in order to be prepared for any situational possibility. How do you carry a karambit? Ultimately, how a karambit is carried depends on how it's being used, who's doing the carrying, how quickly you need access to it, the type of karambit and what you're comfortable with. Are there different types of karambits? Absolutely. Modern karambits come in both fixed blade and folding blade varieties. Some karambits are production karambits, which typically means they're mass-produced by large companies, and others are custom karambits and available on a limited basis. Many custom karambits are designed by a blade smith and are handmade with love, but not all. Some custom karambits are cut by machine and then finished by hand while others are simply designed for a specific client or purpose. Functional karambits are "live" blades, meaning they're sharp. Practice or "training" karambits have no sharpened edges and are designed for accident-free martial arts, tactical, self defense, combative and field instruction and learning. When it comes to karambit design beyond basic categorization (fixed karambit vs. folding karambit, live blade vs. training blade, etc. ), variations, materials and features are practically unlimited. The important thing to remember is that a karambit knife should be designed for function, not form. Dig into the karambit's Southeast Asian roots and several regional varieties will surface. Additionally, while the safety ring and curved blade of the modern karambit are practically universal, the distinctive features of the karambit knife readily lend themselves to diverse functional modifications. For example, if a fighting style utilizes a lot of pressure points, nerve attacks or "control devices," then a tactical karambit with a spur extending from the safety ring offers obvious advantages. If you're an EMT or search and rescue technician, then a deeply serrated back blade would provide you with the ability to saw, cut thick bandages and clothing with ease and handle other routine field, survival or medical tasks. 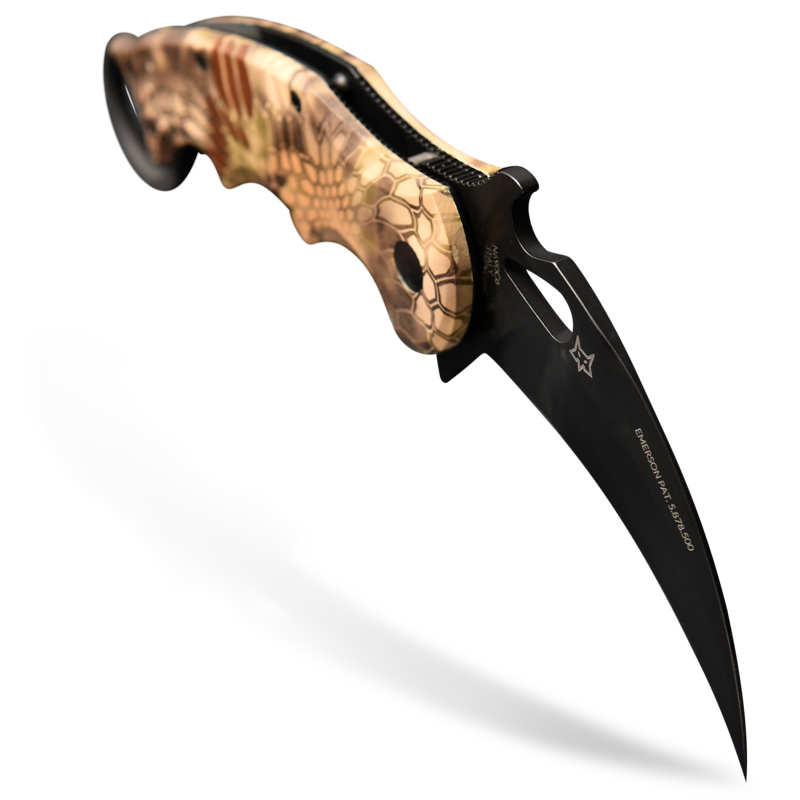 What type of karambit is best? The best type of karambit is the one best suited for the user's needs. Every user and every situation is different. In general, fixed blade karambits offer superior reliability and strength due to the lack of moving parts, but can be more difficult to conceal or carry. Folding karambits more closely mirror the Western "pocket knife," but may not offer the assured safety or sturdiness required for some applications. As a rule of thumb, the more functionality and utility you demand of a karambit, the closer you should stick to traditional karambit design (fixed blade, safety ring, sharply curved blade). However, there's not a magic answer and no "one size fits all" karambit. First answer the question, "What will I do with this karambit?" and then review karambit anatomy and variations before selecting the karambit best suited for your needs. Are karambits legal to own? Generally, yes. Karambits are regulated at the state level and while each state's laws can vary, most allow utility, work and functional blades that have a blade length of 3" or less or that are specifically designed for hunting or agricultural use. Be certain to check your state's laws regarding karambits and remember that by purchasing a blade from karambit.com, you're agreeing to abide by your local statutes. Are karambits legal to carry concealed? Conceal carry laws vary widely state to state. Generally, a person carrying an item that could be used as a weapon who is also concealing it must have a Concealed Carry permit or license. However, it's best to check your state's laws. While some states allow small blades to be concealed and carried for every day or routine use, others require that any knife user who wants to carry a concealed knife that could serve as a weapon hold a CCW permit. What are the federal laws in the United States about karambits? Karambits are not currently federally controlled by the United States government and are instead regulated at the state level. Each state's knife laws can vary widely and there is little rhyme or reason to the statutes currently on the books. Some states have no legislation concerning the ownership, carry or use of karambits while karambits are outright forbidden in a couple. Always check and abide by the laws in your state as well as those of any states you may travel to or frequent. The American Knife and Tool Institute offers some great resources for sorting through karambit laws and knife legalities. Find Law is a great resource for looking up your state's knife and karambit regulations and statutes. Is the karambit a fighting knife? The karambit is a multi-purpose utility knife. While the karambit's features readily lend themselves to combative and tactical use and its use in battle has been finely honed through centuries of field testing via perpetual Southeast Asian conflict and war, the karambit has been, will be and remains, first and foremost, a tool. It is not specifically designed for fighting or as a fighting knife and even though fighting karambits exist, its traditional purpose centers around every day carry and use. I'm not a martial artist. I'm a hunter, fisherman, rock climber or backpacker. Can a karambit be useful to me as a utility knife? Absolutely. The karambit was originally developed as an agricultural and field tool. It can be used for gutting, cleaning, scoring, scaling, cleanly slicing ropes, survival situations and many other utilitarian purposes. Particularly for users who may find themselves in difficult situations (like rock climbers, cavers, spelunkers and hikers), the karambit's safety features and blade stability in all environments and in any position can't be beat. Additionally, unlike other field or survival knives, a karambit will stay securely in your hand even if your hand is open, tying a knot or doing something else, like carrying a flashlight or gun. I'm military, a first responder, EMT, paramedic, search and rescue technician, LEO, or other field operative with boots on the ground. Can a karambit serve as a field, tactical or survival knife? Most definitely. The karambit excels in tense, high-stress and chaotic situations and due to the sharply curving blade, it provides unparalleled access to tight or difficult to reach areas. The karambit's ring allows it to be safely used while the carrier is upside down, suspended in open air, underwater, in tight spaces or otherwise working in problematic/restrictive environments. 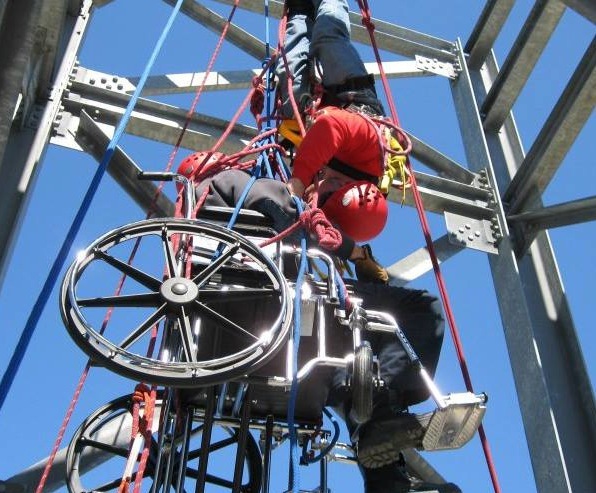 The safety ring provides stability during tasks requiring fine motor control, like cutting off a patient's restrictive clothing, removing mud-caked bandages from a swollen limb or during intricate field and medical procedures. Simply put, the karambit is designed for maximum efficiency, safety and functionality. 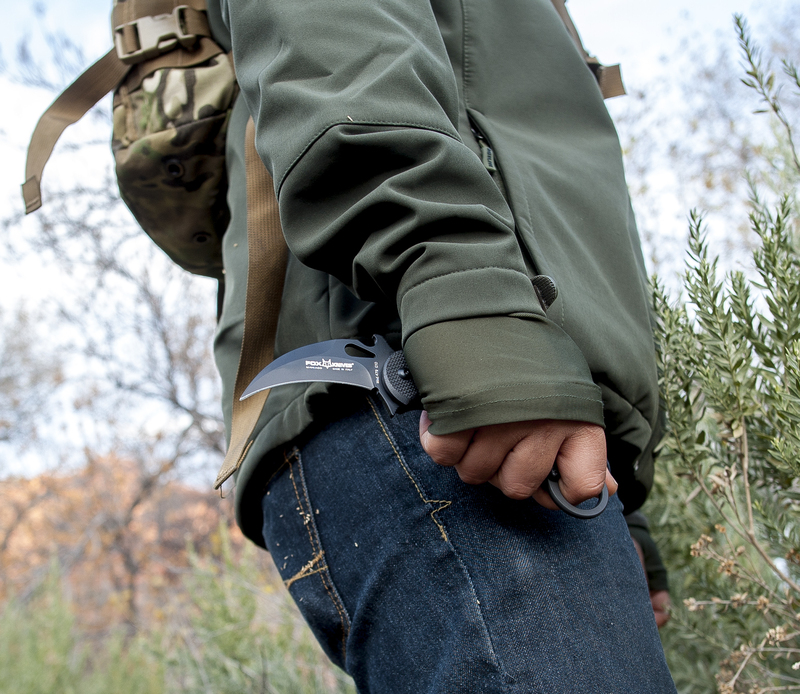 In a line of work where seconds can mean the difference between life and death, carrying a karambit as a field knife allows you to work smarter, not harder. While it's our hope here at karambit.com that you never face a dangerous situation, if you find yourself in a combative struggle while in the line of duty, rest assured that a karambit, with proper training, will readily double as a potent self defense tool. Can I carry a karambit as an every day carry blade? Yes. From the 11th century on, the karambit has proven itself to be a fully capable every day carry knife. Whether wielding a karambit for work, chores, household use, hunting, fishing, recreation, backcountry survival, self defense or for martial arts, a karambit knife is a practical choice for a safe, multi-use every day carry blade. Are there varieties of karambits that are best for beginners? A fixed blade karambit is generally best for beginners as it offers the most reliability and widest range of use. There are no moving parts to worry about and the new user can focus on becoming familiar with the function, balance and use of the blade instead of getting cut while opening and closing it. How can I learn to use a karambit? The best way to learn to use a karambit is to find someone who is able to proficiently utilize one for the same purposes and tasks you'd like to be able to do. Whether that's field use, hunting, on the job or self defense, typically, learning from those who have mastered karambit use in your venue is your best and safest bet. When it comes to karambit use in self defense, close quarters combat (CQC) and as a personal or professional weapon, the karambit is intimately tied to the Southeast Asian martial arts of Pencak Silat and Filipino Kali and has been for over a millennium. While you may be able to find a skilled karambit practitioner outside of the SEAsian combative arts, it's extremely rare for a person to be able to take full advantage of the karambit's tactical features (LINK) without at least some training in silat or kali. Both arts are blade arts and both are survival oriented with little interest in sport application. Silat and kali specialize in teaching its practitioners to walk away from an engagement alive at any cost and to utilize any tool or weapon available to its full potential. The karambit, silat, and other Filipino martial arts developed side by side and all are quite complementary. Tuhon Ray Dionaldo of FCS Kali is a world-renowned karambit expert and is widely recognized both in and out of the Filipino martial arts (FMA) community as the go-to source for functional, combat-ready karambit training. Other well-known karambit instructors, teachers and masters include Jagabaya Steve Tarani, Guru Maul Mornie of Silat Suffian Bela Diri, and Kuya Doug Marcaida of Rochester Kali. Should I learn to spin a karambit? No. Or, at least, not right away. Karambit spinning, while flashy and fun, is unnecessary to utilize a karambit to its full potential. It's a neat trick, but it takes intimate familiarity with the balance of your karambit, how it moves in your hand and how gravity works with/against it while it's in motion to safely pull spinning or other advanced karambit transitions off. Additionally, the ligaments and muscles in the hand and forearm take a lot of conditioning to be able to safely guide a karambit through a full rotation without losing momentum part of the way through, which almost always results in the tip of the karambit being buried in your forearm. Instead of spinning your karambit right way, begin with familiarizing yourself with the various karambit grips and their uses. Is a training karambit necessary? For most people, yes. If you're an individual who does not need to learn to utilize the karambit as a self defense or safety tool, then you probably won't need a training karambit. However, if there's any chance you're going to be involving another person in your practice sessions or the work you're doing with a karambit requires a specialized skill set or movement of any kind, you need a practice karambit. It's better to be safe than sorry; karambit injuries (LINK) are nothing to scoff at. At what point should you switch from a training blade to a live blade? When you're certain you won't injure yourself, innocent bystanders or a training partner. Familiarity with your live karambit knife is vital, but safety should always come first when learning to use a karambit. When in doubt, use a practice karambit. I've heard karambits are dangerous. Are they? No. A karambit is merely a tool. An individual carrying a karambit may be dangerous, but a karambit on its own is harmless. Like any knife, the karambit's capability must be respected by its user. Karambits are very sharp, don't handle like the knives most people are familiar with and oftentimes have multiple cutting surfaces and functions. Karambits are not a toy, "for looks" or anything other than a tool requiring proper blade awareness and training for safe use. If you are a knife designer, dealer, or maker and you want to know more about how Karambit.com Tactical Knives works and how you can sell your knives here, check out our "Information for Custom Karambit Producers." If you are seeking information concerning our shipping or return policies, you'll find them here. If you have any other questions, comments, concerns, thoughts, inquiries or ideas you'd like addressed, please don't hesitate to contact us.